How to remove lead from your drinking water? 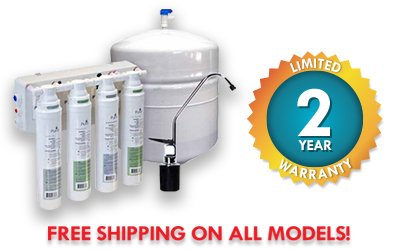 Remove 94% to 96% of lead from your drinking water and make it safe to drink and lead free! Reverse osmosis (RO) is a separation process that uses pressure to force a solution through a membrane that retains the solute on one side and allows the pure solvent to pass to the other side. It is the process of forcing a solvent from a region of high solute concentration through a membrane to a region of low solute concentration by applying a pressure in excess of the osmotic pressure. This is the reverse of the normal osmosis process, which is the natural movement of solvent from an area of low solute concentration, through a membrane, to an area of high solute concentration when no external pressure is applied. The membrane here is semipermeable, meaning it allows the passage of solvent but not of solute. Each of these systems are complete and ready to install!